The Summercross was built on a site which had been occupied by Busk House and then replaced by Summer Cross Cottage in the early part of the 19th Century. The Otley-Tadcaster turnpike was opened in the mid 1700’s and a toll house erected. (Incidentally, in a lecture in March 1925, the late Mr. Charles Joshua Fernside Sinclair recollected that there was a toll bar just above the cemetery gate, and the Summercross was built as a putting-up place for farmers so that they could evade the toll!). Both 1841 and 1851 censuses show that Summer Cross Cottages were occupied by Samuel Hartley, gardener and his family, and the 1861 census shows the cottages being occupied by Grace Waterhouse and her daughter Sarah. 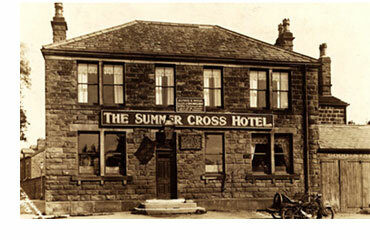 Ten years later, the census showed Ellis Hartley (son of Samuel) living with his wife, four daughters and two sons at the now re-named Summer Cross Inn. The 1881 census showed it was occupied by Samuel Green, licensed victualler, and his family. Also, the 1891 census shows the hotel occupied by Leeds born Thomas L. Walker, publican, with his wife, two sons and a servant, and the 1901 and 1911 censuses show the hotel occupied by Keighley born William Hennery Normington, together with his wife and servant. J. R. Holmes & Sons of Bingley Brewery, sold the property by auction in 1919 to Hammonds Bradford Brewery. Extensive structural and internal changes were made in or around 1937 when the stables and other outbuildings were demolished and the two bays built at the front of the building. There were many more Landlords which followed, the last ones being Barry and Pamela Mills who vacated the pub when it was closed October 2007. In January 2008, Chartford Homes, Developer, requested that the Summercross pub should be demolished with an application to build 14 homes, but a campaign group “Save our Summercross (SOS),” backed by Otley MP Greg Mulholland, the Town Council and ward councillors, vowed to do everything they could to stop the scheme and get the pub re-opened. In December 2008, a Pub company confirmed it wished to re-open the hotel as it was convinced it would be a success. They approached Chartford Homes but they did not respond. A spokesman for Chartford Homes confirmed it had been informally approached by a pub firm but had not entered into any discussion. He said that Westward Care had agreed to purchase the site, subject to obtaining planning permission. It was later announced by local press that Westward Care Ltd had been successful in their Change of Use application to alter and extend the former public house. In November 2010, MP Greg Mulholland wrote to Westward Care demanding something should be done with the site as planning permission to transform the site into a 46 room care home had been granted in February 2009 and no construction work had taken place. There were two companies who were prepared to transfer the site into a pub once more and wanted Westward Care to reveal their plans or sell up, but the Managing Director of Westward Care stated that the site was still part of the company’s strategic plan. As at the end of November 2012 the building is still boarded up but the outbuildings have been demolished.